Why should you Engage with the Edinburgh Institute? We are here for one purpose: to help you create and craft your singular, best Competitive & Compelling Advantage and Edge. And as you would expect, we do things differently; but it isnt just what we do differently that is important, it is how we do it and why. We only want to work with individuals and organisations that share those principles and values, to make commerce better for humanity in a remarkable and meaningful way. Our Tenets are something we hold dear; they are listed below so you can get the shape of how and why we do what we do. We hope you like it. We think you will. 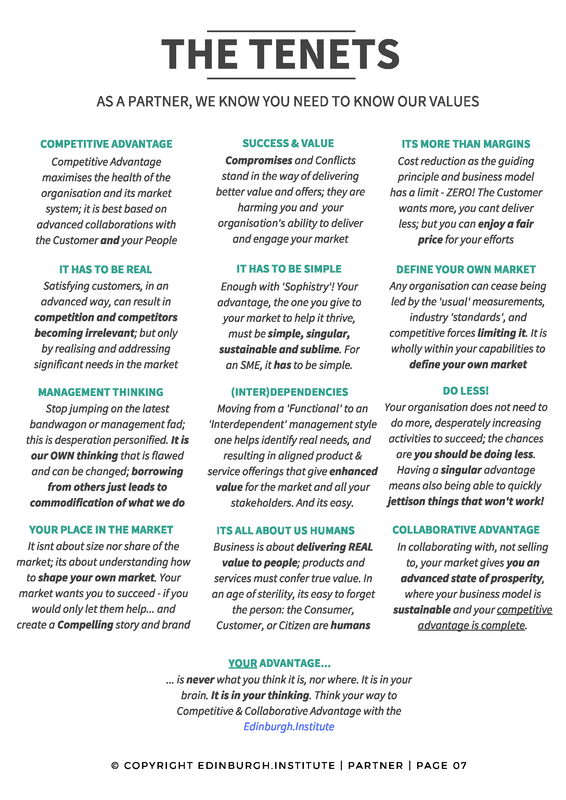 Is to give you your singular, best Competitive (and Compelling) Advantage, creating your own market, on your terms. That’s it. must be simple, singular, sustainable and sublime. For an SME, it has to be simple. commodification of what we do! Your organisation does not need to do more, desperately increasing activities to succeed; the chances are you should be doing less. Having a singular advantage means also being able to quickly jettison things that won’t work! where your business model is sustainable and your competitive advantage is complete.